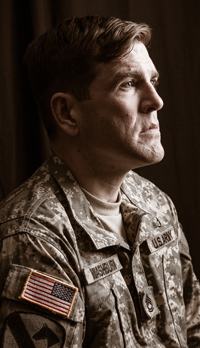 Home > Blog > How Can an Opera Help Vets with PTSD? How Can an Opera Help Vets with PTSD? NOTE: This blog post originally appeared here. How can an opera help military veterans with Post Traumatic Stress Disorder (PTSD)? It’s certainly an unlikely combination, yet when I began composing music for a new opera called The Canticle of the Black Madonna back in 2011, not even I could imagine how profoundly it would affect the military veteran community. The story actually begins in the summer of 2010 when my partner, Tiziana DellaRovere, penned the libretto (the script) for what would eventually become our four-year operatic collaboration. That year saw the dual tragedies of the Gulf Oil Spill and heightened levels of violent conflict in Afghanistan, with corresponding levels of PTSD among returning soldiers. Out of that summer’s painful headlines, Tiziana crafted The Canticle of the Black Madonna using elements of modern opera, Jungian psychodrama, and classical oratorio to do for today’s soldiers what Sophocles did for the Greeks of old: create a space of ritual healing for civilians and veterans alike. Tiziana has first-hand experience of PTSD. Her father was a decorated officer in the Italian military who fought two wars and came home a changed man. The World War Two generation didn’t have a diagnosis for PTSD or an explanation for how war heroes could become suddenly and unpredictably violent with their families. Tiziana’s beautifully-wrought story is healing not only for combat veterans, but also for their close friends and family who can no longer understand or recognize them as a result of their new and seemingly alien behaviors. While composing The Canticle of the Black Madonna, I often tried to reassure myself that it was acceptable for me, a civilian, to tell a soldier’s story through music. After all, William Shakespeare and Giuseppe Verdi never traveled very far from home, much less fought in any of the wars they wrote about. But after the opera was workshopped at the University of Oregon in 2013, I discovered a deeper truth: far from questioning my credentials as a civilian, the military community responded with open and profound gratitude. Why? Because one of the great tragedies of PTSD—one of the reasons it’s such a major factor in the nearly 22 veteran suicides occurring every day—is that it’s associated with a level of social isolation that we civilians can hardly imagine. And in the face of the misunderstanding, rejection, and worst of all, the apathy that many civilians show our returning veterans, the idea that two civilians would voluntarily work for four years to tell a veteran’s story has been received by many as an open-hearted offering that we will meet you half way, and like the Greeks of old, we will meet in the sacred temple of the theater and together we will share tears of sorrow and joy. Ethan Gans-Morse is Executive Director of Anima Mundi Productions. 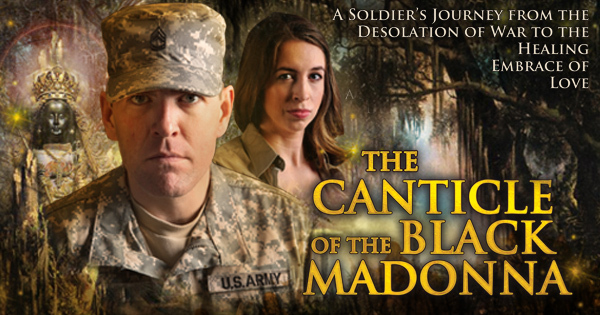 The Canticle of the Black Madonna premieres on September 5 and 6, 2014. The opera is currently trending on the Indiegogo crowdfunding website and has garnered a matching donor. Find out more at http://igg.me/at/CBMopera.